It sounds good to me. I certainly wouldn't mind getting to all that with the first post or two. Although, whatever you might think of my writing, I can't say concise is something I do well. But I'll try! Should I continue with my alley cat? Or have you decided against it? I don't mind having her, but it would probably be faster to get started with two cats than three, if you're interested in starting ASAP. Or we could delay her entrance into the story, if you still think it would be better to have her along. Passion with nowhere to go becomes Poison. Okay, to tell the truth, I want a scrapper. I want to see a cat in this system just... go into a righteous furious clawstorm. I just want to see a scrapper. So imbalanced... just a cat... but one who wont back down from a big dog, just pounces forward and gives it a rake right over its nose. Its cool to ward and seek and acrobat around using tricks and name magic, and a very strong component to the cat legend is how they are tricksters, I appreciate that. But pound for pound, housecats are some of the most efficient predators out there. Just think about that... lions... no... sharks... no... whole packs of wolves... no. Pound for pound and calorie for calorie... its the cat. I love that irony. I would concider it a personal favor to have someone play a high level Fighting cat... someone whos bad to the bone. So what I think would be fun is we start out things with the two of you nice and cozy. You can make the alleycat as things go and just when you find it useful... we bring in the scrapper and you describe her territory in relation to our first two and we just go from there. Will that work for everyone? It can get us moving and let me... I mean, us, of course... have our scrapper. Give me a bit. Ill try and post us up a beginning thread. Oh, about everything to cover, this isnt a homework assignment. Its just a checklist of things Ill need from you at some point through the story... or Ill have to make some of them up. If you dont give me any local trouble, might be a good place to put a dog. No landmarks mentioned... well, an old abandoned and unsafe treehouse could be great right there. Ill put a link between both this thread and the new setting thread Ill be opening up. Name: Wild Heart (although she has many names, and few ever call her by her preferred title). Wild Heart is a sleek and athletic feral cat, possessing big green eyes and a tan coat intermixed with dark spots and stripes, resembling those of larger, more feral breeds of greater felines. In fact, her resemblance leads her to boast that she is of strong bloodlines, more closely resembling the cat's primal roots, directly bred from Tigers and Cheetahs. 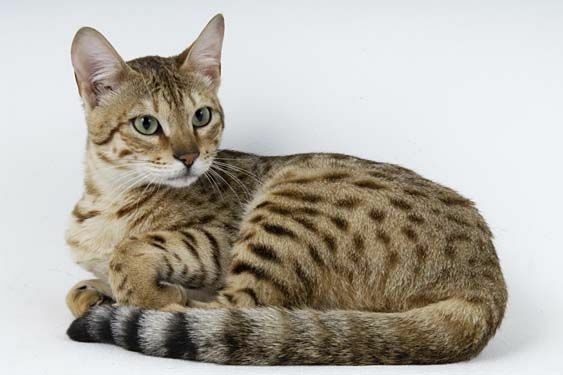 It's difficult to tell whether she is telling the truth, as such lines are known to occur rarely, although it remains to be seen whether she is an authentic mixed-breed Chausie, or simply descended from domestic cats bred to simply resemble wild breeds, but with no true legacy, like Toygers or Bengals. The mere fact that it comes from Wild Heart, after all, tends to get most cats to doubt it. Heck, there are some who wonder if that's her actual form, or just the form she chose to represent herself in, so she can make those wild claims. The other local felines have a good reason to be suspicious. Wild Heart is a notoriously sketchy shaper of the truth, often framing events and taking liberties with the facts to frame the narrative to suit her whims of the moment, and her whims are often fickle and capricious. She is a proud, confident cat in her own way, one who believes that the political games and established territories of the Parliament are silly, and often tests her limits on what will be found acceptable and what she can get away with. A liar, trickster, and a thief by many accounts, she is often invading the boundaries of other cats, and causing various manners of strife between the political alliances and stroking rivalries. An accomplished Shaper and deceiver, she has been known to take the guises of other felines and perfectly assume their roles, mixed in with odd behaviors to create a bit of chaos within a cat's domain, and making all witnesses difficult to rely on. Her presence truly is a chaotic one within the community, and she is often the go-to cat when there's something suspicious about a recent transgression. So, if she's such a bothersome feline, why is Wild Heart even permitted within Parliamentary grounds? Many a cat has asked such a question, but the inner council has been reluctant to rid themselves of her. While she is undoubtedly a troublemaker, her motivations are hardly the most malicious of intents. She does it for her own amusement, and little other purpose. She's had opportunities to forcibly take the territories of other cats, but she hasn't. The strife she causes are often temporary and short-lived in the span of time, and rarely do the interfere with actual, important business. Her talents often make her quite useful as well. She is one of the athletic felines in the region, speedy, exceptionally nimble, top-notch climbing and leaping prowess, and with a graceful maneuverability that few cats have ever managed to keep up with, let alone pass (making the prospect of running her off quite difficult, just logistically speaking). Her fighting ability is nothing to laugh off either. Her technique isn't the purist, but she has no shame about being underhanded or unorthodox to better those who have a more solid form, and leveling the playing field more in her favor. She's incredibly stealthy and has strong predatory instincts, allowing her to be a ideal scout and a hunter of more problematic animals of the region. And her scrupulous nature can be reeled in for productive purposes for an influential cat when they have a sensitive, sneaky task they need done quietly and discretely, especially if it needs to be under the nose of the official procedures. With an amusing enough task, and good enough trade, she can be tamed. Wild Heart's reputation often plays her up to be a more intimidating and problematic cat than she really is. In fact, she plays it up herself, because she likes the reactions she gets. In truth, Wild Heart is just a playful. She doesn't seek much actual harm in her silly games and deceptions, just to enjoy herself and have a good time. It makes her something of a rule-breaker and a hedonist, to be sure, and she is a bit arrogant in her manner of speech. But, to those willing to humor her and get to know her, she can be a rather engaging, a natural entertainer and jokester who is fond of games and likes to spread fun just as much as she likes to have it (most cats do think her tricks are pretty funny, when she isn't doing it to them). She isn't shy of sharing her things, and isn't particularly rude to those who come into her territory, and she can appreciate a good trick, even if she's the victim of it. The fact that other cats can get so riled up by her simple pranks and games, to her, is a bit of a joke itself, so she does intentionally revel in the name-calling and her outsider status, just to reflect how absurd she feels they are being. Naturally, Wild Heart isn't the most responsible of cats, and she has a difficult time stopping herself when there's potential fun to be had. She isn't particularly stupid, but she is quite impulsive and tends to act in her thoughts and feelings of the moment. But, if it can get across to her how important a task is, especially if it would save lives or great harm to the community, she usually can put the games aside and focus, at least for a time. Still, her attention span tends to be rather short, so complicated plans and menial tasks aren't really her forte, as she may abandon or forget about them in the pursuit of something more interesting. In fact, she doesn't always remember the smaller details of even her own schemes, and isn't always lying when her facts don't match up with the others of a situation. Even she can't always discern the truth of an incident she was involved in, but she would always deny being responsible for any serious consequences. She knows herself well enough to know that she wouldn't cause irreparable harm on a whim (or she likes to think so). Being a feral cat, Wild Heart doesn't live with a set of humans in particular, but that doesn't mean she doesn't have burdens, mostly amongst those who are natural outsiders themselves. One is a vagrant, a psychologically disturbed older man, who sees her as a kindred drifter, and sometimes shares the food he finds with her. It's not often tasty, choice meat, but she is moved by the fact of a human who has so little still tries to offer it to her, so she returns the favor and protects him from the threats he cannot see in the night. Another is a pre-teen girl, one who often comes to her territory often to escape a chaotic home life. The girl shines a lot of attention on her, grooms her and shows her a lot of affection. While she may technically belong to the territory of another cat, Wild Heart takes care of her while she is in her presence, and has infringed on other territories before to keep her safe. Wild Heart is also more accepting than most about contacts outside that of her species. She may seek to establish relationships with sapient rodents, avian, or even canines. She finds their differences rather interesting, so she's more intrigued by the possibility of alliances with them than she often is with other cats. Wild Heart sounds glorious Now were we meant to do the introduciton posts or were you going to add some sort of frame into the IC thread first MFT? My arm has been hurt by some joint malfunction. Probably bursitis. Anyway, its really strained my creativity and typing. Sorry about that... Ill have to mend this arm to get back onto those PMs and such I need to answer. Once more, I appologize and hope all will be well once I get to get back onto the keyboard like I should be. Thanks. Got the first entry up. Saw a doctor, I think she got me on the right course to fix up. Its just a general quick description. I could probably set up an OOC note on the Parliamentary politics and such of the area. This is just to get the ball rolling. If you two want to start your entries we can start things moving. I will need a kid apiece from you three to involve in the "Black Silver" story line. For Bergins this is easy. One of the kids could be your burden. For Felicia and Wild Heart, this can be a visiting youth your elder burdens or perhaps a foster child about ready to run away again whos staying 'for now' in the neighbor. There will be a fourth child as well which will be mine to control. I need any descriptions or details you want established... mean, nice, akward, nerd, sassy, troubled... whatever. Ill need to make certain 'liberties' to get all four together and onto the story but it shouldnt be too difficult. About Wild Heart, doesnt she need another name so everyone doesnt know her true name? Thanks for helping me on this. Its going to be a lot of fun. I cant wait to see where we get to take this. My apologies for the delay! It's been a rough couple of weeks for me, and I really haven't had much time for posting in any games. Still, I should have sent word sooner. I'm in a pretty decent position to get a post in at the moment, however. But, thanks to my carelessness, I'd left you both hanging for a little while. Are you guys still interested in the game? If so, I'll get something up ASAP. But, I wouldn't blame you if you already wrote this one off, due to my inactivity. Again, sorry for that. She has two names. Wild Heart is just the name she goes by. Her true name is Moonlit Dancer. I wanted it to be something fairly unexpected. Ive been sick. This has led to other problems at work and paying bills... plus I dont have much energy. Creativity requires real physical energy... really weird, I know. So it might be a few days before I will get answers up. With work and all, it might be the 25th to 26th before I reply. Im sorry to let you down. I cant wait to continue our story. Thank you for your patients. If you want to make rolls against this character, feel free. their own, but they become smarter as they gather. I do not mind the pace myself Might take until weekend for me to reply to the IC post though as I'm on a tight schedule.